Familiar– (adj) of or pertaining to family. Una empresa familiar. A family business. Coffee, at any stage in the chain, can’t help but be a family business. All stages of coffee production and processing lend themselves to apprenticeship. As a father prunes his plants, his son follows along and learns. As a mother sorts unripe cherries from ripe ones, her daughter sits with her and learns. As the mill foreman pushes the fruit through the depulper, his nephew peers into the churning machinery and learns. Working with coffee is always hands on, which makes it kind of cool and interesting to kids. It’s not as boring as mom or dad hunched over a screen. The work necessary to grow and process coffee is the kind of stuff that makes kids curious, and therefore it’s the kind of stuff they learn by seeing, helping with, and doing independently at a young age. Working with coffee is familiar; it’s the kind of work you would want to do and can do with your family. Picking coffee is often a family affair, and you can joke and laugh and sing with your family while at work up in the cafetal. A family business is not just one where you hire your cousin and your brother is a partner; it’s a business where your family is welcome and wants to be. 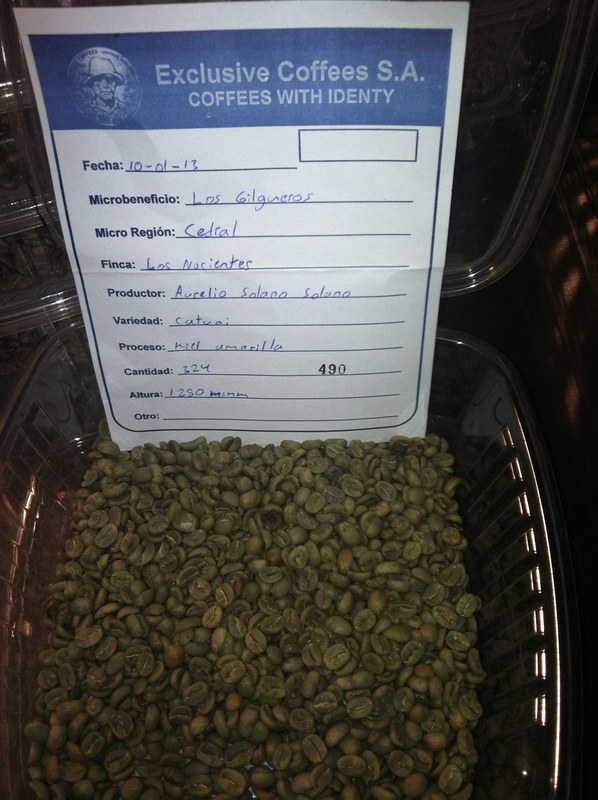 Yesterday I visited Exclusive Coffees, one of Costa Rica’s top micromill exporters. They’re the ones who facilitate direct trade by hulling, packing and shipping coffee from small family producers to small, often family owned/run, roasters all over the world. They are the sole “middleman” carrying out the logistics in operations where both other parties know and like each other. Exclusive Coffees is a family business in the best kind of way. When I walked in a young girl was sitting at with the receptionist, sticking stickers onto empty coffee bags. When I later met with the owner he introduced her as, “a very special employee, my daughter.” I smiled and remembered all the summer vacations I’d spent in my mom’s office, sticking labels on envelopes for a coveted 50 cents an hour. Upstairs I was shown the cupping lab. Because Exclusive facilitates relationships between growers and roasters, they are active educators of the producers and meticulously checking quality and maintaining traceability. They cup every lot from every one of the 83 fincas they work with and all farmers are able to taste their own coffee; many also graduate from cupping courses run by Specialty Coffee Association of Costa Rica staff. 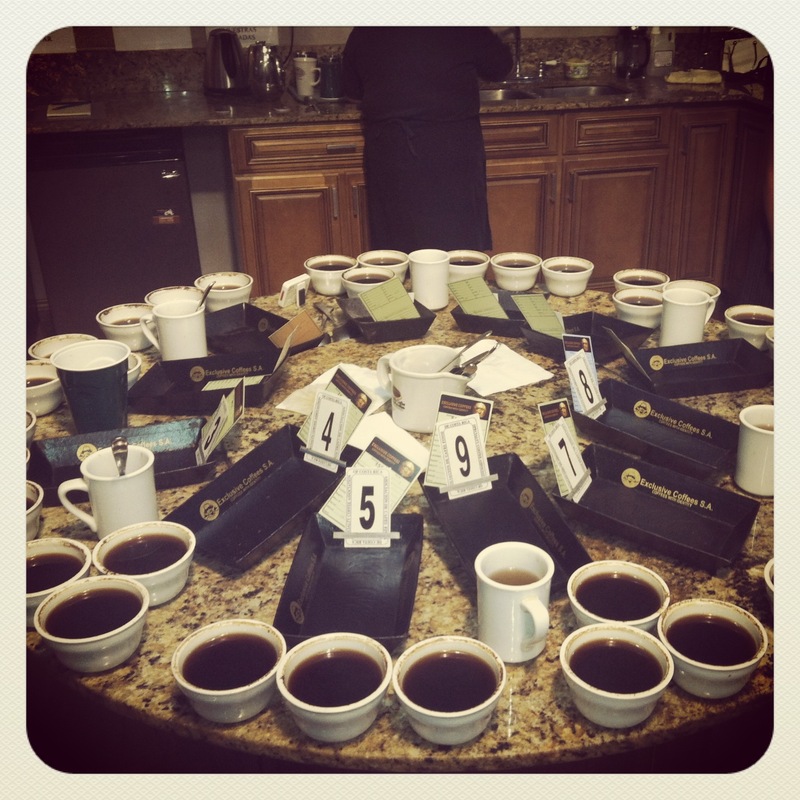 Yesterday one such cupping was taking place, with a couple blindly cupping their own harvest among 11 other coffees. As I joined in the cupping rotation (literally, the table of 36 cups, 3 of each sample, spins like a giant lazy coffee susan), the owner’s daughter came bounding up the stairs. “Want to cup too?” he asked her. She nodded and eagerly grabbed an apron from a hook. Without any instruction from anyone she headed to the dish drainer and selected a cup and a spoon. She then walked over to sample number 1, and proceeded to take a spoonful, swish it around in her mouth, and then spit it into her cup- just like a seasoned cupper. The familiarity of her movements communicates that she is no stranger to the cupping table. At only about 10 years old, someone, probably someones, have taught her the basic steps to cupping. True, she doesn’t have a score sheet to record Q Grades on, but she not only knows the process, she wants to do it and likes doing it. She may never officially “go to work” for her dad and maybe she’ll be a figure skater or something far removed from coffee, but she will always be part of the family business because her dad’s business is a place where she is welcome, comfortable, and happy. The literal space the business occupies is one in which she clearly spends time (probably more now because it’s summer vacation), time she enjoys. She isn’t cordoned from a boardroom or told to sit at one little table with a coloring book and told to keep herself busy and quiet. She’s able and encouraged to cup the coffees on the table, peer into the spinning roaster, and talk to everyone. An hour or so later her dad calls her to leave; she puts on her lady bug backpack and hugs every employee in the room- none of any actual relation to her- before she scurries down the stairs. A family business is a place where the roaster, the cupper, and the exporter treat the owner’s daughter like a niece. It’s a place where the owner can go drop his daughter off on a play date in the middle of the morning on a Wednesday without feeling judged or worrying that his employees will sit on their hands while he’s gone. The mentality that permeates a truly family business is that the work done there is the kind of thing in which you’d be happy to include your 10 year old daughter. Farther up the chain coffee can become an impersonal commodity and a cold table of futures contracts, but at origin it’s always familiar, and it’s always the product of lots of face to face, hand to hand personal relationships. Truly direct trade coffee keeps this family business quality all the way to the roasting and consumer sale. In direct trade the roaster/distributor knows the actual people involved in growing, processing and delivering the coffee they buy. In the case of actual direct trade the buyer will be able to tell you that the growers just replanted half their property with Typica coffee trees when they ripped up the old Caturra and that middleman takes the stairs two at a time. A real family business is one where the owner tells me, “make yourself at home, we have nothing to hide here,” hands me an apron so I can cup too, and lets me look through the stacks of sample coffees until I find the ones from the farms I’ve visited, so that I can take pictures. A family run direct trade business is one where the employees and the owner alike don’t need to consult tables to know which growers sell to each roasters; they have the names on the tips of their tongues because they meet with both- in person- again and again.